As usual, the weekend has gone by way too quickly for my liking. Saturday I almost didn't know what to do with myself since I had gotten my long run out of the way on Friday. We were supposed to go to the lake with the family, however, my dad had not had a chance to put the boat in the water yet to make sure it was running properly. Trust me, you don't want to get in the middle of the lake and the boat poop out especially with kids on board. So, I decided to get in a short 3-miler and was planning on Cathe Friedrich's MMA Boxing (or part of it) and some abs after. Jason finally got himself out of bed and was up for a run with me. We set out towards the arts center, then to head towards downtown. Apparently he didn't really believe me when I said 3 miles. And of course he's got every right not to believe that statement. Over the years I'd say one number but really plot out another. Anyway, we ended up heading out on a longer route. But it turned out to be fine really...except for the damn hills. I had wanted an easy run. Hills don't fall under the category of easy if you ask me. And for whatever insane reason, we have a habit of powering up the hills. At one point we were hitting an 8:15 pace. Um, not exactly what I had planned, especially upfreakinghill. After the run, I did just 2 segments of the upper body only for Cathe's MMA Boxing workout then abs (20 mins total) then stretched out for a bit. 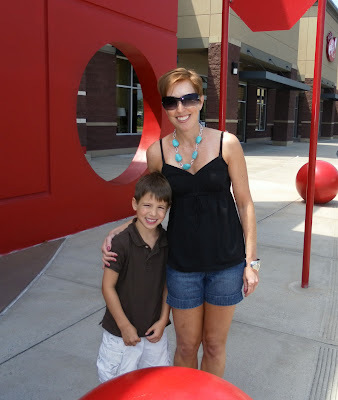 Since my day was pretty much free, I decided it was the perfect opportunity to meet my sister at a Target about halfway between us to take my nephew shopping for his birthday (which was May 19). I had taken my niece shopping for her birthday back in October and my nephew decided then and there that's what he wanted to do for his birthday. We ended up being on vacation for his birthday party (of course I felt bad). But honestly, they never even notice us there with all their friends. So this individual, one-on-one time is really so much more special. We got into the store and I asked C if he knew what he wanted (Sarah had already told me he had it planned). He looked at me with his sly little smile and said, "Nope, I was just teasing her." Ha. But he really did know what he wanted. We spent a very long time in the Lego's aisle I'll just say that much. The one boxed set he wanted they were out of and he had me searching high and low for it. I have no idea what set he got, heck, I didn't know there were so many brands or types of freaking Lego's! All that matters was that he was a happy camper. When I got home, I decided to jump in the pool and float around for a bit. Then Jason and I opted for a late patio lunch at our local haunt, Dugan's. This morning I got up and decided to head out for a really short 2-mile run. I wanted to use the short distance to try to focus on engaging my glutes and focus on my foot landing. Rather than being a pronator, I am the absolute opposite. I supinate to the point where the insides of my shoes look like they've never touched the ground. After my run, I did just the punching/leg combos from Cathe's MMA Kickboxing then some major stretching. And I was done with workouts by 9:30 am. Love that! I did get some yard work taken care of, then house cleaning and more laundry taken care of before being lazy and lounging on the patio (with a few dips in the pool of course). Jason and I decided to be bad and eat out again today for another late lunch. He had plans to go to the movies with a friend, so I think it was more of a peace offering. We ended up going to a pizza joint down the street that we really enjoy called Vino's.